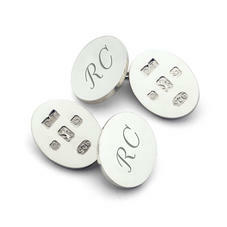 Our Classic Sterling Silver Cufflinks can be engraved with up to four personalised initials. Please note: The size and style of font used to engrave our Classic Sterling Silver Cufflinks will depend upon the number of initials requested. Website images are enlarged to show the placement of the engraving and are for illustration purposes only. Any specific font requirements should be discussed with our friendly Customer Services Team prior to placing an order.